Danny Valencia is a solid infielder with pop in his bat. KANSAS CITY, Mo. 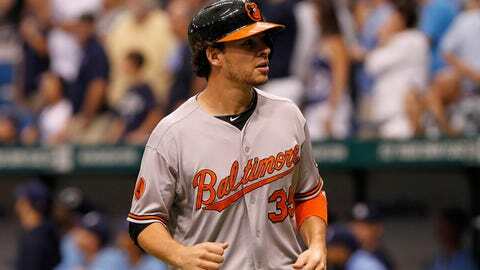 — Royals general manager Dayton Moore had a difficult decision as he tried to complete the deal for Baltimore corner infielder Danny Valencia. Moore had always coveted Valencia, a solid defender with pop in his bat, but the guy the Orioles wanted in return was someone Moore hated losing — outfielder David Lough. “But David was the guy that they kept insisting on,” Moore told FOXSportsKansasCity.com by phone. “And at the end of the day, as much as I didn’t want to lose David, the deal made sense for our ballclub. Moore got what he needed — a right-handed bat in Valencia who can play first and third and be a pinch-hit threat. Valencia, 29, hit .304 in 52 games last season with 14 doubles, eight homers and 23 RBIs. Valencia also could serve as a potential safety net in the event starting third baseman Mike Moustakas stumbles out of the gate again next season. But Moore stopped short of suggesting Valencia could serve in a platoon situation with Moustakas. “But that’s not to say Ned (Yost) won’t match up in certain situations,” Moore said. “We’re always going to want to put the best possible lineup on the field each night. In some respects, Valencia will serve a similar role as Miguel Tejada did last year, though Tejada also could play the middle infield. Lough, 27, hit .286 in 96 games for the Royals last season. Lough became somewhat expendable with the acquisition of Norichika Aoki, who will play right field. The Royals also have Jarrod Dyson and Justin Maxwell as fourth and fifth outfielders. Valencia, who also has played for Boston and Minnesota, is a career .263 hitter.